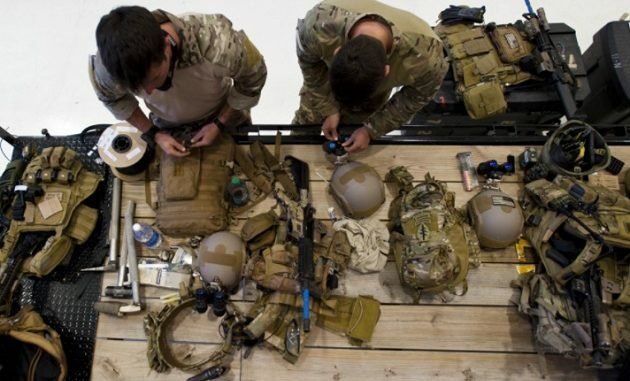 Special Forces Green Berets prepare their weapons and gear prior to a training event. (photo by Tech Sgt Jorge Intriago, South Carolina National Guard, May 19, 2014). SOF News Update 20180313 – AFSOC Air Commando recognized, UW in Lithuania, American Freedom Distillery, SF in Africa, Ranger School and life lessons, 1st SOW and Facebook, female Rangers talk on career, SF medic receives award, SEAL takes Gold in PyeongChang Paralympics, moving (?) AFRICOM HQs, and more. Air Commando Recognized for Life Saving Act. Senior Airman Gregory Ward provided life-saving assistance to a woman after she fell two stories. He coordinated with rescue personnel and went to the hospital in the ambulance with her. Read “AFSOC Air Commando Rescues Woman”, Air Force Medicine, March 9, 2018. SF in Africa. Joe Penney, a photo-journalist based in West Africa and co-founder of a news site covering sub-Saharan Africa, provides his perspective of U.S. Special Forces activities in northern and west Africa. “Africa, Latest Theater in America’s Endless War”, The New York Review of Books, March 12, 2018. Possible Move for AFRICOM HQs. For some reason U.S. Africa Command is located in . . . Europe. Some U.S. Senators are thinking maybe it should be on the African continent. (Military Times, Mar 13, 2018). Ranger School and Life Lessons. Wes Cochrane graduated from Ranger School several years back. As he reflects back on his experience he has come up with 7 lessons that have stuck with him. (LinkedIn, Mar 8, 2018). 1st SOW and Facebook. The commander of the 1st Special Operations Wing, Col Thomas Palenske, uses a social media account to track issues in his command and to inform his personnel and their families. See “Air Force taking notice of local commander’s social media”, NWF Daily News, March 12, 2018. SF Medic Receives Award. 1st Sgt. Jarrid Collins of Special Warfare Center and School has been awarded the Maj. Gen. John K. Singlaub Award. His contributions to Special Operations Forces during the last few years embodied the physical bravery, visionary leadership, and strong intellect associated with the award. Read more in “USASOC Presents Prestigious Award to Special Forces Medic”, Army.mil, March 12, 2018. Female Rangers Talk on Career. Two women who passed Ranger School talk about their post-Ranger School careers. “First Female Ranger Grads Open Up About the Aftermath and Joining the Infantry”, Army Times, March 13, 2018. SEAL Takes Gold. Navy SEAL Daniel Cnossen won gold in this year’s PyeongChang biathlon event. “SEAL, double amputee takes gold in PyeongChang Paralympics”, Navy Times, March 12, 2018. American Freedom Distillery. Ten retired Green Berets are entering into an endeavor to get into the whiskey business in the Tampa Bay area. See “Green Berets portrayed in movie to open distillery”, Spectrum News, March 8, 2018. UW with Lithuania KASP. During a routine NATO exercise held in Lithuania U.S. Special Forces and members of the Lithuania National Defense Volunteer Forces (KASP) conducted training in unconventional warfare. Read more in “U.S. Special Ops and Lithuanian Reservists Practiced Waging Guerrilla War Against Russia”, The War Zone, March 12, 2018.